Radiation Therapy: A Powerful Weapon Against Cancer. Radiotherapy is our specialty. Our cancer care leadership and medical staff have mastered a variety of radiology techniques by effectively treating a wide array of cancers for nearly 30 years. We are now on a mission to restore hope to San Cristóbal patients with the most advanced radiotherapy available in Ponce and beyond. Image-guided radiation therapy (IGRT) is the use of imaging during radiation therapy to improve the precision and accuracy of treatment delivery. IGRT is used to treat tumors in areas of the body that move, such as the lungs. Radiation therapy machines are equipped with imaging technology to allow your doctor to image the tumor before and during treatment. By comparing these images to the reference images taken during simulation, the patient’s position and/or the radiation beams may be adjusted to more precisely target the radiation dose to the tumor. To help align and target the radiation equipment, some IGRT procedures may use fiducial markers, ultrasound, MRI, x-ray images of the bone structure, CT scan, 3D body surface mapping, electromagnetic transponders or colored ink tattoos on the skin. An advanced form of high-precision radiation therapy that uses linear, computer-controlled x-ray accelerators to deliver precise radiation doses to a malignant tumor or specific areas within the tumor. Said treatment modality allows the radiation dose to conform more accurately to the three-dimensional (3D) shape of the tumor by modulating (or controlling) the intensity of the radiation beam in several small volumes. IMRT makes it possible to focus higher doses on regions within the tumor, while minimizing exposure to radiation in organs near the affected area. The treatment is planned carefully with the help of three-dimensional images of Computed Tomography (CT-Scan), Magnetic Resonance Imaging (MRI) or patient’s PET-Scan, together with computerized dose calculations to determine the intensity pattern that best suits to the shape of the tumor. Currently, IMRT is used to treat prostate, head and neck cancers, as well as the central nervous system. IMRT has also been used in special situations to treat breast, thyroid, and lung cancers, as well as gastrointestinal, gynecological, and certain types of sarcomas. Stereotactic Body Radiation Therapy (SBRT) is becoming and increasingly popular option for treating cancers in the lung, head and neck, prostate, liver and other disease sites. SBRT is a non-invasive treatment procedure similar to SRS, except that it deals with tumors outside the central nervous system. Its objective is to escalate the dose to the target lesion and thus to increase local control while limiting dose to nearby critical structures and normal tissue. Our advanced equipment is designed to treat targets using sub millimeter mechanical accuracy. Radiosurgery can be the treatment of choice for certain cancers. Stereotactic radiosurgery (SRS) delivers high doses of radiation to treat tumors with great precision. SRS is a technique that is most commonly used for tumors or other medical conditions in the brain or central nervous system (CNS). With SRS, clinicians can focus the radiation dose to the outline of the tumor and minimize dose to the surrounding healthy tissue. SRS treatments use high precision, accuracy, and sophisticated 3-D imaging to deliver a concentrated dose of radiation in a single treatment. In some cases fractionated stereotactic radiosurgery is used. This is a process in which the total dose of stereotactic radiation is divided into several smaller doses of radiation on separate days of treatment ranging from two to five treatments. Learn More about this treatment Option. Gated RapidArc radiotherapy makes it possible to monitor patient breathing and compensate for tumor motion while quickly delivering dose during a continuous rotation around the patient. This development enables the use of RapidArc to target lung tumors with greater precision by “gating” the beam, turning it on and off, in response to tumor motion. Gated RapidArc makes it possible to deliver highly targeted treatments to many types of tumors, including lung tumors that are moving. If you’d like to learn more about our Radiotherapy treatments or any of the other services available at our state-of-the-art Cancer Center, please contact us. TrueBeam® is an advanced image-guided radiation therapy (IGRT) system used to treat cancer with speed and accuracy while avoiding healthy tissues and organs. TrueBeam was designed for complex cases of cancer of the lung, breast, stomach, and brain. It also can be used for cancers of the liver and prostate, along with other cancers treated with radiation therapy. TrueBeam® rotates around the patient’s body to deliver radiation therapy from nearly any angle. The system provides real-time imaging, which allows our physicians to direct higher doses of radiation with greater accuracy. At the same time, TrueBeam® respiratory gating technology gives your doctor the ability to synchronize radiation beams with your breathing. For example, doctors can treat a moving lung tumor as if it were standing still. Respiratory gating also protects nearby organs and healthy tissues from unnecessary radiation. The radiation is generated by a machine called a medical linear accelerator. This machine shapes beams of energy with varying intensities, which can be aimed at a tumor from multiple angles to attack the target in a complete three-dimensional manner. 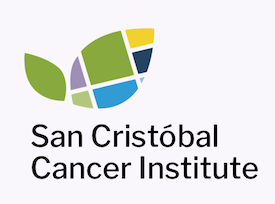 At San Cristóbal Cancer Institute, we use an extremely sophisticated machine that can deliver treatment with submillimeter accuracy and varying intensity. The idea is to deliver the lowest dose possible to the surrounding healthy tissue, while still delivering the maximum dose to the tumor. Our radiotherapy treatment involves several basic steps: diagnosis, the planning of the individual treatment and the delivery of the treatment. After their diagnosis, our medical specialists will generate three-dimensional diagnostic images (usually CT or MRI) of the tumor and the area around it. They then use these images to specify the dose of radiation needed to treat the tumor. A radiation specialist will work with a physicist to plan an individualized treatment. After this, the patient receives individualized TrueBeam treatments according to a schedule specific to the treatment plan. The total dose of radiation is usually divided into smaller doses (called fractions) that are given daily over a specific time period. During a treatment, the linear accelerator can rotate around the patient to deliver the radiation. The radiation is shaped and reshaped as it is continuously delivered from virtually every angle in a 360-degree revolution around the patient. Most treatments usually take only a few minutes a day.